EFI designs and builds the following types of cranes: Single Girder Cranes, Double Girder Cranes, Jib Cranes, Wall Traveling Jib Cranes, Truss Girder Cranes, Gantry Cranes, Monorail Systems, Load and Beam Rigging and Runway Systems for the cranes we build. Single Girder Cranes are typically the most economical choice for light to medium duty bridge cranes. 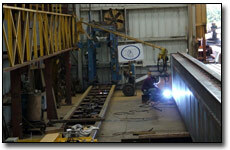 They are available up to 100’ span at 10 ton capacity, up to 80’ at 15 ton, up to 60' at 20 ton. Single girder cranes are available as both top running, or under running where the crane runway beams hang from the existing facility overhead structure. 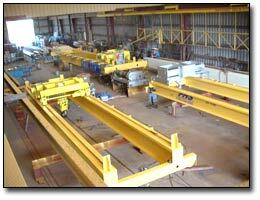 Equipment Fabricators builds nearly 100 single girder cranes each year. 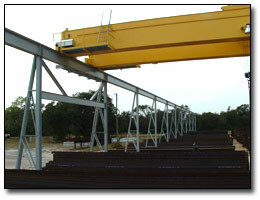 The crane main girder is above the hoist, therefore reducing the available hook height in a given facility. Facility designers tip: If you're designing a new facility, and crane hook height is the primary factor driving the height of the building, consider going with Double Girder cranes. The double girder design gives much better hook height. Depending on the size of the building, the small increase in crane cost may be far less than the cost of a taller building. Also, a common complaint among crane operators and facility managers is inadequate crane hook height. 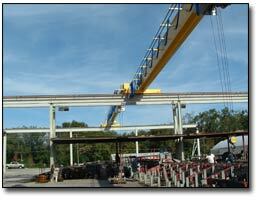 Double Girder Cranes are typically used when the limitations of single girder cranes are reached. 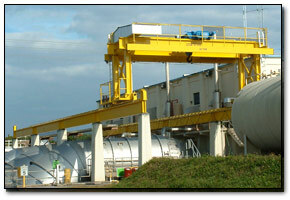 Double Girder cranes are available up to almost limitless span and capacity. Additionally, a vast number of special design features are available. Equipment Fabricators has built these cranes up to 130’ span and has built major components for cranes handling up to 600 ton loads. 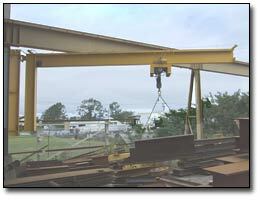 Jib Cranes are often a very economical choice when desired work area is limited. Jib cranes are commonly available and reasonably priced up to 5 ton x 25' boom length. Jibs are commonly used in smaller work station applications and are often used for removing boats from the water where ramps are limited. They are available with motorized rotation as well manual push/pull rotation. 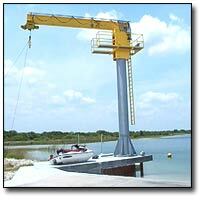 The above pictured EFI built jib crane is used for moving boats in and out of the water. The waterfront location invoked a number of special design features including hot dip galvanized column, sandblast and two coat paint of all other steel, anti-condensation heaters in all motors and controls, higher horse power motors due to operations in the wind, and hurricane tie-downs. 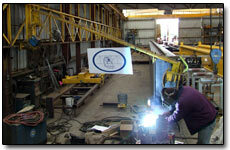 The above pictured EFI built Jib crane is mounted to existing facility structure. When this approach is considered, thorough evaluation of the facility structure must be performed. 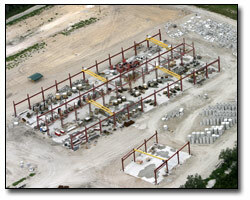 Facility designers note: Free Standing Jib cranes require very large and very deep foundations. 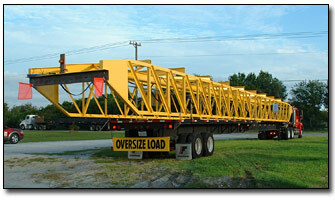 Down the road, many jib crane purchasers wish they had spent their money on bridge cranes. As their business grows, the hook coverage provided by a jib crane rapidly becomes inadequate; and there is no reasonable way to increase the coverage with a jib. Wall Traveling Jib Cranes are somewhat rare due to their high initial cost for both the crane, runway system and the cost for facility structural reinforcements. However, when properly applied and used, they offer tremendous benefits to production while causing little interference with other equipment and operations in the facility. The bridge cranes typically pass over the top of wall traveling jibs. 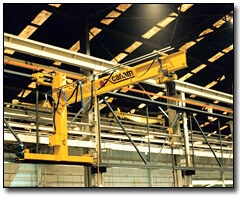 There are a number of manufacturers of light duty wall traveling jib cranes. Spanco, Gorbel and O-Brien to name a few. EFI has developed a very heavy duty wall traveling jib that utilizes swiveling and articulating connections for all major load carrying wheels. While expensive, our wall traveling jibs are providing years of heavy service with very little maintenance long after the other jibs have been taken down and thrown into the "bone yard". 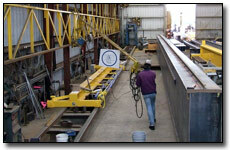 The above pictured EFI designed and built Wall Traveling Jib is one of 5 units in use by a large fabricating plant. The jibs serve a dipping tank for trusses as well as fabrication areas. A number of our jibs are also in use serving production plate burning lines as well. 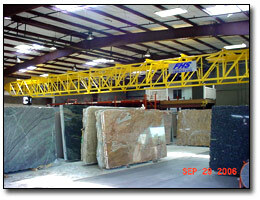 Facility designers note: Wall Traveling Jib cranes invoke substantial loads into the facility columns and foundations. Planning for these jibs should come early in the design phase of the facility. Contact EFI for loading conditions. Another application for wall traveling machinery is EFI's Scorpion Welding and Workstation system. This EFI designed and built wall traveling work station system eliminates shop floor clutter and damage to wire feed welders, torch lines, air lines, 110 v power lines etc. The system puts all (or part of) these utilities up on the swinging and traveling boom instead of on the floor in harms way. Plant mangers note: Tired of the downtime and cost incurred by replacing welding cables and hoses? Call EFI to learn more about how the Scorpion can save you $$$ on maintenance and increase productivity!! Truss Girder Cranes are a variation from the typical beam or box girder that becomes economical when long crane spans are required. Additionally, many truss girders allow the hoist to be located "up into" truss thereby offering much better hook height than a single beam or box girder crane. Also, truss girder cranes are typically more economical than long span beam or box girder cranes. Truss girder cranes offer almost limitless span - but capacity is often limited with longer spans. Truss girders are also used on outdoor long span cranes in order to reduce effects of wind on the crane drive system. 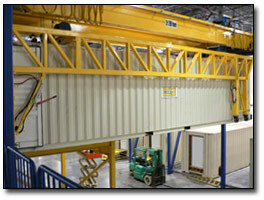 The above pictured EFI designed and built Truss girder crane spans 92'. The building was too low for traditional box girder crane design, so the truss girder was the appropriate choice. In this particular application, the Truss had to be designed shallow enough for the marble sheets to stay below the truss yet high enough get on and off trucks - while in the vertical position. Gantry Cranes offer an economical solution to bridge cranes when the building is inadequate to support a bridge crane or the crane system is to be located outdoors. When floor mounted, the gantry legs will be constantly traveling in the area of workers – thereby creating a workplace hazard. Warning bells must be installed to alert the workers of gantry movement, but after a while, workers tend to get used to the noise and fail to notice it. If the noise is too loud, it aggravates the workers and they disconnect the warning bell: which is even worse! Powering the gantry is problematic: cord reels can be used – but have limited range – and create a hazard in that it is a high-voltage “extension cord” on the ground. Another alternative is a buss bar system running along the length of the runway, but this is yet another added cost that is often unanticipated. Heavier capacity Gantries must have some type of steel rail system to ride on – this rail often impedes forklifts and other equipment. Gantries have a relatively high wheel load, which means the concrete must be quite thick, or strip footers must be installed. The above pictured pair of 10 ton by 50' span gantries was designed and built by EFI to be used in a concrete bucket handling operation. Notice the substantial bracing used to maintain structural rigidity. 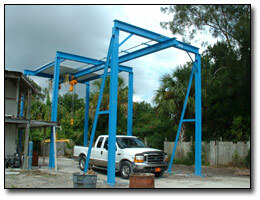 The above pictured Elevated Leg 30 ton x 35' span gantry was designed and built by EFI for a South Florida pump station. 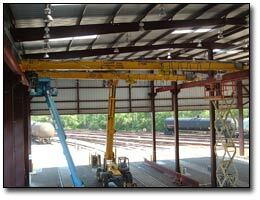 These cranes have a full compliment of outdoor service options: Oversized motors and controls to allow operation in high wind conditions, sandblast and high performance paint systems, Nema 4X enclosures, galvanized fasteners, space heaters in motors and controls, hoist covers, motor covers etc. 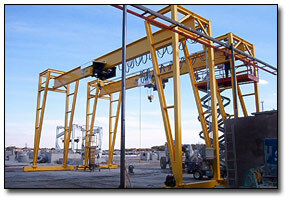 Gantry crane buyers note: Gantries are commonly used outdoors. Without proper design and manufacturing, outdoor electric cranes are very susceptible to water related problems. EFI suggests you clearly understand the outdoor service options and costs offered by your crane builder(s). Outdoor service options are expensive - but it is definitely a "pay me now or pay me later" situation. Monorails can either be designed as self-supported (as shown in picture above) or supported by existing facility overhead steel. Capacity is limited, up to about 20 tons in most cases. Lengths of the rail are almost limitless. 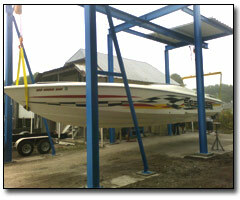 The above pictured EFI designed and built monorail system is used to service boats. Here again, the outdoor service caused the customer to require a high-performance paint system. 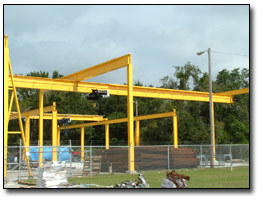 The above pictured EFI designed and built monorail system is used in conjunction with a free-standing bridge crane system in a re-bar fabrication yard. Once the appropriate crane is in place, connecting it to the load must then be considered. A set of chains or chokers often doesn’t work correctly. Appropriate selection of rigging, spreader beams and other under-hook devices is critical to safe and productive use of cranes. EFI has built a number of special below the hook devices. 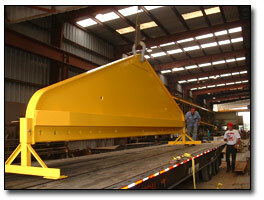 The above pictured EFI designed and built load beam is 23’ long rated at 150 tons. 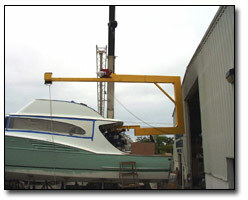 The above pictured very unique load beam was designed and built by EFI to provide a method for a boat manufacturer to install the motors – after the boat was nearly complete. The load beam features a movable counterweight and an electric winch to lower the motor into position. The above pictured specialized load beam arrangement was designed by one of EFI’s distributors, Royce Crane of Atlanta. 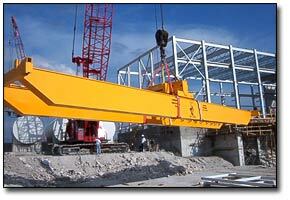 EFI built the crane and load beam system for Royce Crane. The System is used to store and retrieve. Plant mangers note: Improper rigging is the NUMBER ONE cause of accidents when using overhead cranes. We suggest that you develop a thorough knowledge of rigging and then get your workers trained just as well! Additionally, there are many, many below the hook devices that can make your crane operations safer and also much more productive. We suggest a thorough review of the Caldwell Co. catalogue to learn all you can about the numerous devices available. The importance of proper crane runway system design, fabrication and installation is critical to the durability and life span of the crane system. EFI builds runway systems for most of our cranes. Our shop’s crane builders implement the same exacting standards for accuracy and workmanship on the runways as they do the cranes. Many runway systems are built by “red-iron" shops and are un-aware of the importance of the runways. The above pictured EFI designed and built 25’ tall freestanding A-frame runway system sees column loads in the area of 100,000#, 3 shifts per day, 5 days per week. All steel is shot blasted, epoxy primered and top-coated with Alkyd Enamel. Additionally, all un-welded joints are caulked with polyurethane caulk. The above pictured EFI designed and built 30’ tall freestanding runway system is ready to have the roof installed. The facility features 60,000 sf of floor space. All steel is shot blasted and epoxy primered.